I would be lying if I said today’s trek to base camp was easy. In fact, it was one of the hardest days I’ve had in the mountains. I felt, as we say in Newfoundland, that the arse had come out of me. I nursed a small headache, any incline had me out of breath quickly, and I was a bit dizzy and clumsy. I guess my body was a little unhappy with existing on half as much oxygen as at sea level. That said, I still made pretty good time getting here and Dendi kept a close eye. 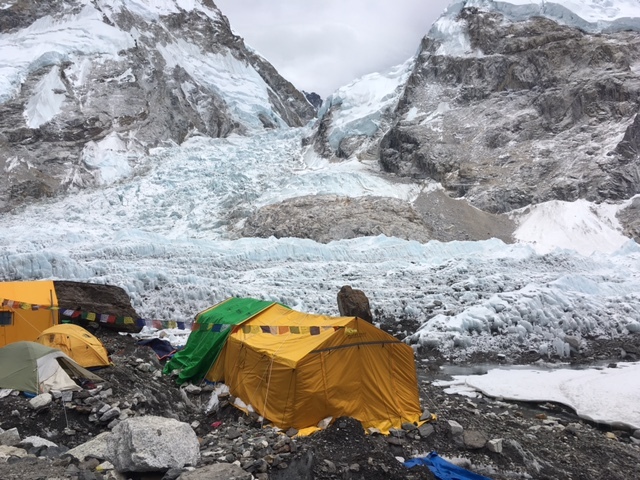 Finally we walked into base camp and we could appreciate the beautiful base camp our Sherpa team has built. It had snowed a wee bit over night so the rocks and peat were a little slippery to start. 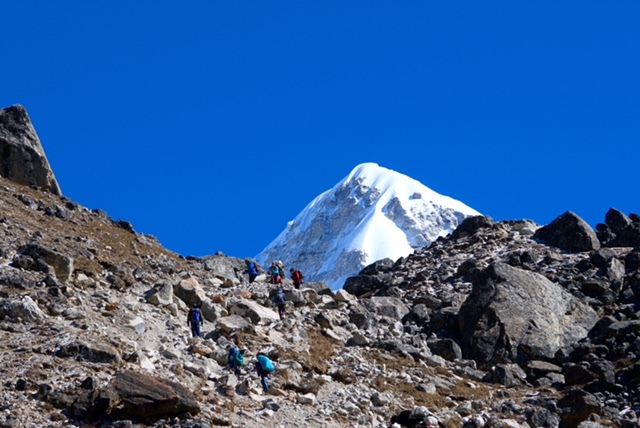 All of the trekkers in the lodge had set out in front of us and we gradually overtook them. The early walk was gradually up until we needed to climb the glacial moraine. 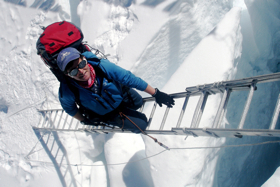 Through the day, Pumori got bigger and bigger overtaking more and more of our view. 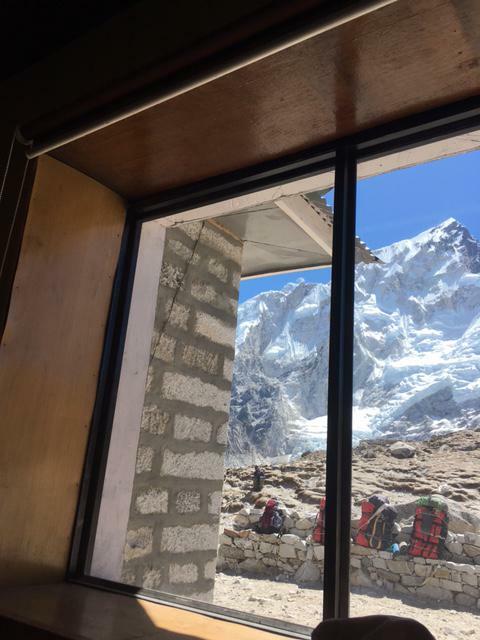 We stopped for a snack in Gorak Shep and got our fifth view of Everest. We could see only the summit pyramid. Can you pick in out in the picture below? We crossed a flat plane that leads over to Kala Patar, a side peak of Pumori and then dropped onto the moraine beside the Khumbu Glacier. The glacial ice is covered in gravel but you can see the small patches of white ice showing through. Near base camp the glacier is steeper so it is the more expected, white/blue ice. 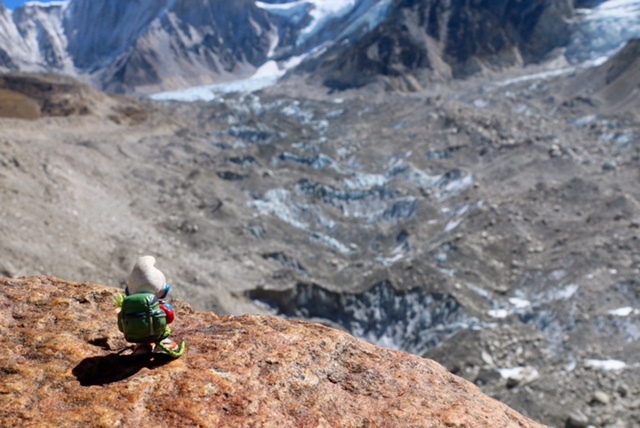 The glacier flows downhill and the icefall is like a rapid in a river with large tumbling blocks. 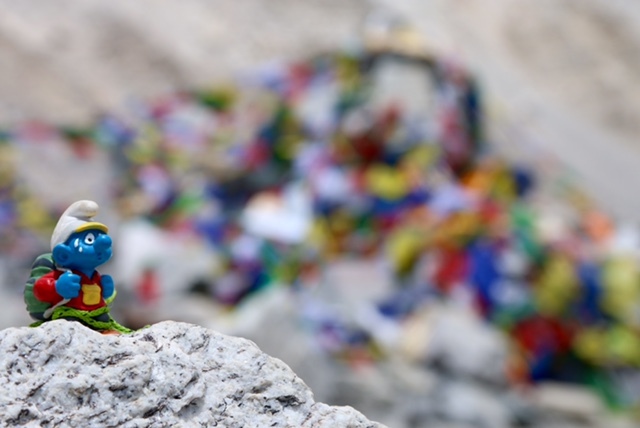 At long last, Climber Smurf and I arrived at the prayer flags that mark the beginning of Everest Base Camp. Base camp stretches over about 2 kilometres. Lakpa and Pemba met us there with hot orange drink to fuel us for the seemingly long slog to our camp. 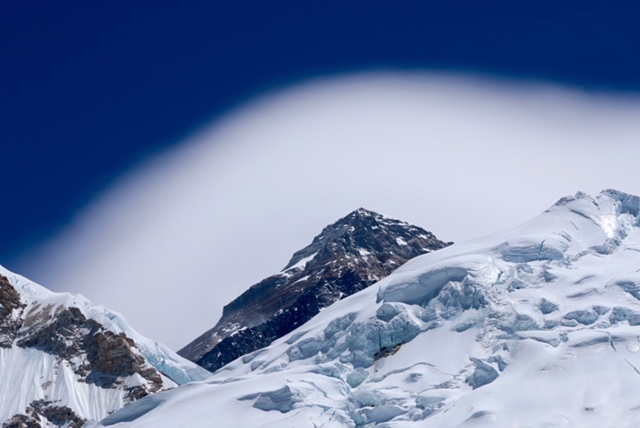 There was a lenticular cloud over the summit of Everest as we arrived. It’s been a little windy and cloudy since we arrived. We all basically opened our duffel bags and started to organize our gear though most of us gave into naps throughout the afternoon. With the crowded lodge last night and the jump to a new altitude, none of had slept particularly well. It’s almost dinner and I’ve enjoyed a few cups of ovaltine for hydration. My spirits have risen with a bit of rest and so now, we’ll keep making steps towards keeping everything focused on the up and up. 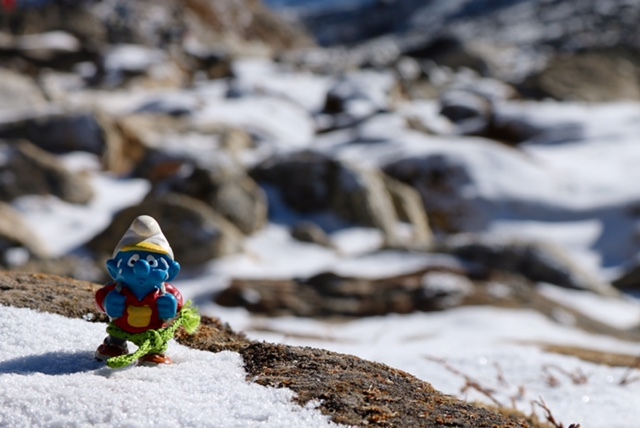 We love climber Smurf. Be safe T.A. xo from Helen Tulk Elem. I love the pictures and hearing your audio posts. Don’t particularly like your cough now though. Cheering you on to the summit! Hoping you can make it all the way, but your safety must come first. God bless.